Co-sponsor: CAAAMA, DC Environmental Film Festival Venue: African American History and Culture Museum Event Location: Oprah WInfrey Theater Cost: Free. Reservations required. Seating is available on a first-come, first seated basis. Get Tickets: http://www.etix.com/ticket/p/8260234 Related Exhibition: A Changing America: Beyond 1968; Cultural Expressions Women of the LA Rebellion Often overlooked, this block of short films explores the contribution of women filmmakers to the UCLA filmmaking movement known as “The LA Rebellion.” Brick by Brick, 1982, USA dir. Shirikiana Aina The changing landscape of late-70s Washington, DC. is documented as an alternative to late-70s gentrification is provided by the Seaton Street project, in which tenants united to purchase buildings. Participants discuss their effort as part of a worldwide struggle against displacement. Cycles, 1989, USA dir. Zeinabu Davis This exuberant experimental drama draws on Caribbean folklore and uses animation and live action to discover a film language unique to African American women. The multilayered soundtrack combines a chorus of women's voices with the music of Africa and the diaspora including Miriam Makeba, acapella singers from Haiti and trumpetiste Clora Bryant. Creating A Different Image, 1989, USA dir. O.Funmilayo Makarah A jubilant affirmation of self-identity, Creating a Different Image is Alile Sharon Larkin in her words defiantly declaring, "I am an artist." Learn more about the personal life and professional aspirations of the filmmaker behind Your Children Come Back to You (1979), A Different Image (1982), Dreadlocks and the Three Bears (1991) and much more. Your Children Come Back To You, 1979, USA dir. Alile Sharon Larkin Alile Sharon Larkin's first film is a contemporary allegory about values and assimilation. The film literalizes the meaning of a "mother country" by means of the story of a young girl, Tovi, torn between two her nationalist mother and a comfortably bourgeois Aunt. DEFINE, 1988, USA dir. O.Funmilayo Makarah An oblique meditation on the semiotics of ethnic female identity accompanies a cynical narration about how to “win an invitation to the dominant culture.” Illusions, 1982, USA dir. Julie Dash Mignon Duprée, a Black woman studio executive who appears to be white and Ester Jeeter, an African American woman who is the singing voice for a white Hollywood star are forced to come to grips with a society that perpetuates false images as status quo. This highly-acclaimed drama by one of the leading African American women directors follows Mignon's dilemma, Ester's struggle and the use of cinema in wartime Hollywood: three illusions in conflict with reality. Spirits of the Rebellion, 2016, USA dir. 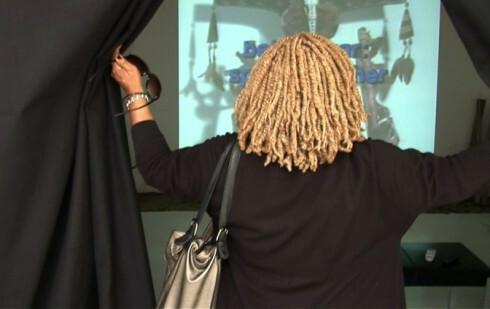 Zeinabu Davis Spirits of Rebellion documents the lives and work of a small group of critically acclaimed, but as of yet relatively unknown group of black filmmakers and media artists known as the Los Angeles Rebellion. The first sustained movement in the United States by a collective of minority filmmakers, it aims to reimagine the production process so as to represent, reflect on, and enrich the day to day lives of people in their communities.